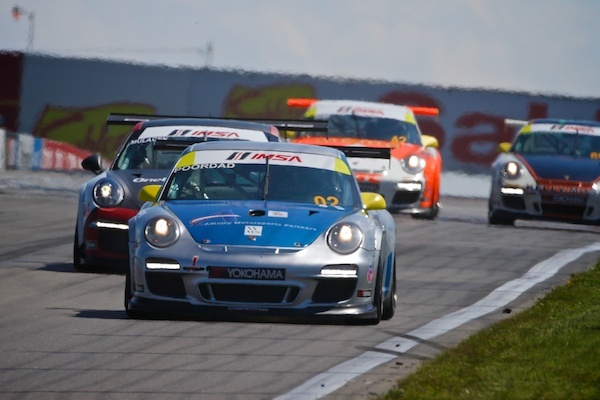 Watkins Glen, N.Y. – The firs t 45-minute IMSA Porsche GT3 Cup USA Presented by Yokohama race at Watkins Glen proved to be a mixed bag of results for Competition Motorsports in Round 7 of the championship. 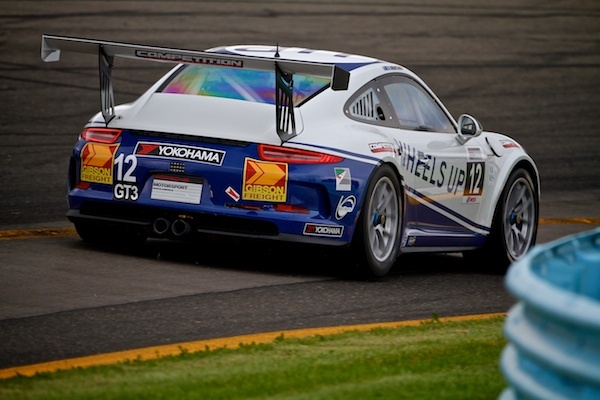 An uncharacteristically caution-free race created an exciting sprint to the finish with the hard racing that has come to be expected from the competitive Porsche series, but left absolutely no room for error on the part of the drivers. 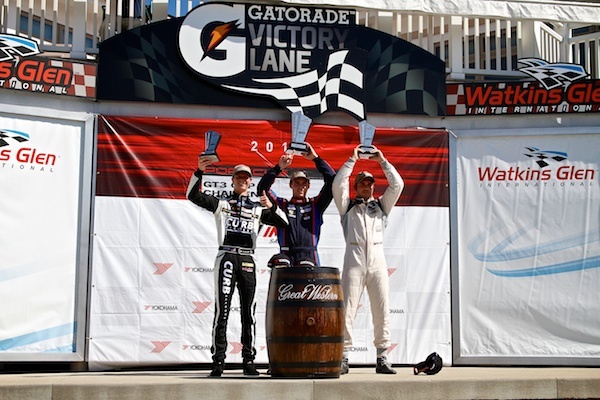 Michael Lewis highlighted Competition Motorsports’ efforts in Race 1 and brought home his third podium of the season with a third place result. A gear issue forced David Calvert-Jones to settle for a disappointing 19thplace finish, while Fred Poordad brought home a hard-fought finish of ninth in class. Lewis drove a fast and clean race while maintaining the third position in his No. 98 Competition Motorsports/Curb Agajanian Porsche. He managed to gain a position on the start, but ultimately lost it back again due to traffic battles despite consistently laying down lap times on par with the leader. 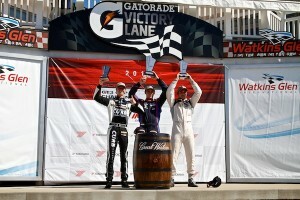 He finished the race fighting for a higher position as the top-three finishers took the checkered flag within a razor-slim margin of .3 seconds of each other. Calvert-Jones had a similarly strong run during the first 30 minutes of the race. Focused on laying down clean laps and hitting all of his marks, he managed to make up a position early on and make progress in the top ten, only to have to head to the pits early when a gear issue ended his race prematurely. In Gold Class competition, Poordad suffered some misfortune after getting knocked into a quick spin at the start of the race which cost him valuable positions and put him outside of the top-10 after his promising second place grid position. He quickly set to work making up positions in his No. 02 Affinity Motorsports/TLI/Competition Motorsports Porsche. Ultimately, Poordad fought back to a well-deserved eighth place finish, despite also fighting the heat due to failed cooling systems during the long fast hot all green flag run to the checkered flag. The team heads into Race 2 tomorrow with optimism, still in good position in the championship. Ahead of the race, the three drivers took part in a short 20-minute qualifying session that was cut even shorter due to a red flag. In spite of the shortened time allotted, the Competition Motorsports team was still able to showcase both the speed of their Porsche machines and capability of their drivers as Lewis placed his No. 98 Competition Motorsports/Curb Agajanian Porsche in third position for the Platinum Class while Calvert-Jones put his No. 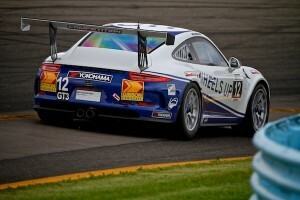 12 Wheels Up-Competition Motorsports Porsche in 10th place. Poordad also capitalized on the short qualifying session in Gold Class competition and started Race 1 from the second position in his No. 02 Affinity Motorsports/TLI/Competition Motorsports Porsche. The team now looks forward to Race 2 which is set to go green on Saturday evening at 6:35 PM (ET).